Surface irrigation Uncontrolled flooding, Border strip,Check,Basin,Furrow method. In all the surface methods, Surface irrigation Uncontrolled flooding, Border strip,Check,Basin,Furrow method. of irrigation, water is either ponded on the soil or allowed to flow continuously over the soil surface for the duration of irrigation. Although surface irrigation, Surface irrigation Uncontrolled flooding, Border strip,Check,Basin,Furrow method. is the oldest and most common method of irrigation, it does not result in high levels of performance. This is mainly because of uncertain infiltration rates which are affected by year-to-year changes in the cropping pattern, cultivation practices, climatic factors, and many other factors. As a result, correct estimation of irrigation efficiency of surface irrigation is difficult. Application efficiencies for surface methods may range from about 40 to 80 per cent. levees to guide or restrict the flow of water on the field, the method is called ‘uncontrolled’, wild or ‘free’ flooding. In this method of flooding, water is brought to field ditches and then admitted at one end of the field thus letting it flood the entire field without any control. field and insufficient irrigation at the outlet end. Application efficiency is reduced because of either deep percolation (in case of longer duration of flooding) or flowing away of water (in case of shorter flooding duration) from the field. The application efficiency would also depend on the depth of flooding, the rate of intake of water into the soil, the size of the stream, and topography of the field. disadvantage of greater loss of water due to deep percolation and surface runoff. strips which can be 3-20 metres wide and 100-400 metres long. These strips are separated by low levees (or borders). The strips are level between levees but slope along the length according to natural slope. If possible, the slope should be between 0.2 and 0.4 per cent. But, slopes as flat as 0.1 per cent and as steep as 8 per cent can also be used (1). In case of steep slope, care should be taken to prevent erosion of soil. Clay loam and clayey soils require much flatter slopes (around 0.2%) of the border strips because of low infiltration rate. Medium soils may have slopes ranging from 0.2 to 0.4%. Sandy soils can have slopes ranging from 0.25 to 0.6%. Water from the supply ditch is diverted to these strips along which it flows slowly towards the downstream end and in the process it wets and irrigates the soil. When the water supply is stopped, it recedes from the upstream end to the downsteam end. require prolonged flooding which, in this case, is difficult to maintain because of the slope. This method, however, requires preparation of land involving high initial cost. divided into a number of almost levelled plots (compartments or ‘Kiaries’) surrounded by levees.Water is admitted from the farmer’s watercourse to these plots turn by turn. This method is suitable for a wide range of soils ranging from very permeable to heavy soils. 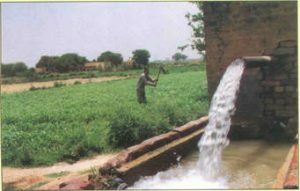 The farmer has very good control over the distribution of water in different areas of his farm. Loss of water through deep percolation (near the supply ditch) and surface runoff can be minimised and adequate irrigation of the entire farm can be achieved. Thus, application efficiency is higher for this method. However, this method requires constant attendance and work (allowing and closing the supplies to the levelled plots). Besides, there is some loss of cultivable area which is occupied by the levees. Sometimes, levees are made sufficiently wide so that some ‘row’ crops can be grown over the levee surface. one tree. However, where conditions are favourable, two or more trees can be included in one basin. during each irrigation. An alternative to flooding the entire land surface is to construct small channels along the primary direction of the movement of water and letting the water flow through these channels which are termed ‘furrows’, ‘creases’ or ‘corrugation’. Furrows are small channels having a continuous and almost uniform slope in the direction of irrigation. Water infiltrates through the wetted perimeter of the furrows and moves vertically and then laterally to saturate the soil. Furrows are used to irrigate crops planted in rows. to 200 metres are the desirable lengths and more common. Very long furrows may result in excessive deep percolation losses and soil erosion near the upstream end of the field. Preferable slope for furrows ranges between 0.5 and 3.0 per cent. Many different classes of soil have been satisfactorily irrigated with furrow slope ranging from 3 to 6 per cent . In case of steep slopes, care should be taken to control erosion. Spacing of furrows for row crops (such as corn, potatoes, sugarbeet, etc.) is decided by the required spacing of the plant rows. The furrow stream should be small enough to prevent the flowing water from coming in direct contact with the plant. Furrows of depth 20 to 30 cm are satisfactory for soils of low permeability. For other soils, furrows may be kept 8 to 12 cm deep. earthen banks. Alternatively, a small-diameter pipe of light weight plastic or rubber can be used to siphon water from the ditch to the furrows without disturbing the banks of the earthen ditch. reduces the evaporation loss considerably. Besides, puddling of heavy soils is also lessened and it is possible to start cultivation soon after irrigation. Furrows provide better on-farm water management capabilities for most of the surface irrigation conditions, and variable and severe topographical conditions. For example, with the change in supply conditions, number of simultaneously supplied furrows can be easily changed. In this manner, very high irrigation efficiency can be achieved. (v) Furrow irrigation requires more labour than any other surface irrigation method.